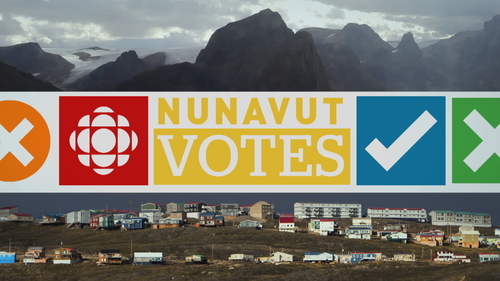 Good evening everyone, and welcome to CBC North’s Nunavut election night live blog! My name’s Garrett Hinchey, I’m CBC North’s social media editor and I’ll be your host for the evening from our newsroom in Iqaluit. It’s going to be an exciting evening tonight, and we’ll be bringing you results, reaction and analysis all evening. Feel free to ask questions of myself or our guests, and to share your thoughts on tonight’s election using our comment function - unfortunately, I will only be able to respond in English, but our TV and radio broadcast tonight - and our election dashboard - will be in both English and Inuktitut. - Our election special will be live at 9 p.m. ET/8 p.m. CT/7 p.m. MT on CBC television and CBC Radio One - one hour after polls close. - Follow the hashtag #Nuvotes on Twitter for live updates from our reporters in the field. - Follow our CBC Nunavut Facebook page for updates and videos throughout the night. - At about 8 p.m. ET, we'll welcome Aaron Watson, an Interpretive Centre coordinator, freelance photographer and well-known community volunteer here in Iqaluit, who was involved in Franco Buscemi's campaign in Iqaluit-Niaqunnguu. - At about 8:30, Pitsiulaaq Brewster, an Inuit artist and activist, and founding vice-chair of the Aboriginal Healing Foundation, will join us. And CBC North legislative reporter Jane Sponagle will pop in and out throughout the night (she's currently about to go live on CBC News Network). Aggu is going to be a closer race then people think. Here are five things to watch in the Nunavut territorial election today. Aggu is an interesting race. Paul Quassa is a high profile cabinet minister and has made no secret of his desire to be premier in the next government. He's facing two political newcomers, Jerome Sheaves and Matt Teed, as well as hamlet councillor Richard Amarualik. Quassa's inability to get Bill 37 on the floor for a vote recently could be seen as a knock against him, and he only won election in 2013 by 13 votes (with a very low voter turnout - under 50 per cent). I think the race could come down to whether voters in Aggu want to have a regular MLA or are happy having their representative in cabinet. I'd watch for voter turnout numbers here - if that turnout percentage spikes, that likely means voters are motivated to make a change. 1583 voters voted in advance polls this year across the territory, by the way, but we don't know how that breaks down by constituency. I was wondering if you would know when the Next Territorial Election is after tonight?? Hi Ben! 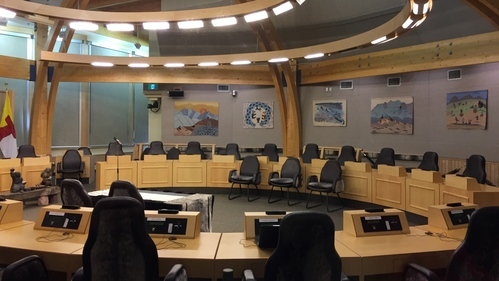 Territorial elections take place in Nunavut every four years, so the next one would be in 2021. 5 minutes now until polls close across the territory. It'll be a little bit after that before we have results, but one thing we should get quickly is the results of the territory's student poll, which do not count toward the results, but are always an interesting read! They'll be released after the polls close. We're just welcoming Aaron Watson into the blog. Aaron is an Interpretive Centre coordinator, freelance photographer and well-known community volunteer here in Iqaluit (and disclosure - he worked on Franco Buscemi's campaign here). Little technical difficulties on our end getting Aaron into the blog... stay tuned. Hello, I made it in. Thanks. So the polls are closed, how is everyone feeling? Hi! Can you remind me which candidates have said they would like to be Premier? Hi Ruth! Jane Sponagle, our CBC North legislative reporter is about to enter the blog - she would be the perfect person to answer that question. I've been counting down for the election results all day! This is so exciting! Nothing like following census government elections. Yes, some races I am very interest in are Arviat North-Whale Cove, Iqaluit-Manirajak and Uqqummiut. All three I find interesting because there are seasoned politicians and newcomers alike. Hi Ruth - Okalik Eegeesiak told me during our interview is wants to run for premier. Both Paul Okalik and Paul Quassa ran for premier, so if they're both re-elected, I would not be surprised if we would see their names in the leadship forum. Aaron, you've been on the campaign trail in a sense... what have you hearing from people in Iqaluit-Niaqunnguu in regards to ballot box issues? A lot of people were disappointed there was no polling station in Apex at the Abe Okpik Hall, as there usually is on elections. Some expressed worry that the Apex turnout may be lower because of that, Garrett. I agree with Aaron - Arviat North-Whale Cove, Iqaluit-Manirajak, Uqqummiut are really interesting. I'm also following Rankin Inlet South. Total rematch of 2013. Wonder which way voters will sway this time. Interesting. Any insight on what it seemed like was motivating voters when it came to choosing a candidate? With so many young families in the riding, childcare and education was definitely a top issue with many of the people I talked to. These two issues and housing came to the forefront of all three campaigns eventually during the campaign. Hello! Wondering if the live CBC TV/Online stream will be in english as well? It sure is, MA! The show will be bilingual - they'll be presenting info and results in English and Inuktitut. Hi MA - our coverage tonight is bilingual on radio and on TV/online stream. Here's a question for both Aaron and Jane. We've seen a high number of incumbents running this election - only 3 have decided not to. Do you think there are any that you might see as being in trouble? Does that maybe say something about MLAs' confidence in the performance of the last government? We had some pretty creative campaigning in Iqaluit Niaqunnguu with Franco holding a rally, Pat having a parade and Anne having a tent event on Apex Road. It's been an entertaining riding to be in, that's for sure. I saw (and heard) Pat's parade yesterday from the CBC station! Followed by a Cindy Rennie truck with speakers on the roof. Ooooh - good question, Garrett. I think we could see Allan Rumbolt have some trouble in the Sanikiluaq constituency of Hudson Bay. I think voters there are really split. I think all three incumbents that decided not to run, may have just had a long enough run in the GN. They are all close to retirement age. Also, they may be moving on to different political ambitions with a federal election in a couple years, who knows? Also, there may have been confidence issues. I mean they ended with Bill 37 which was pretty controversial. I think another one is Uqqummiut - like we mentioned before. The incumbent Pauloosie Keyootak is from Qikiqtarjuaq, a much smaller community than neighbouring Clyde River. We've traditionally seen a candidate from Clyde River win since it's bigger. So he could be in trouble there.